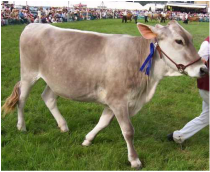 The Brown Swiss breed is thought to be about 4000 years old coming from the valleys and slopes of the Swiss alps. The Guernsey breed originated on the Isle of Guernsey off the French coast about 940 AD. The Jersey cattle origin is not clear. It is thought to have originated in Asia and eventually making its way to the Jersey Island off France. Shorthorn is a cross of Teeswater and Druham cattle. The Shorthorn was used for both beef and dairy until it was separated into two different breeds. The Shorthorn is designated as one of the Wisconsin State Domestic Animals. Click the breeds for more information.